Matlock Town v Nantwich Town. 'Ted Cribley challenges 'keeper William Jaaskelannan in the first half. Caretaker boss David Hoole’s first game in charge brought about a battling performance and a hard earned point - the bonus being a clean sheet against a strong looking Stourbridge at the DCJ Group Arena on Wednesday night. Matlock grew into the contest after a shaky start and showed a steely determination to keep their goal intact. Who will score the goals in the absence of injured top scorer Shaun Harrad remains a problem although they did go close on three occasions. Hoole brought Jan Yeomans, Ted Cribley and Harry Limb into the starting eleven in place of Jake Phillips, Marshall Willock and Curtis Morrison, who had all started previous bosses Craig Hopkins and Glenn Kirkwood’s final game in charge last weekend, a 1-0 defeat at Rushall. In that game Matlock conceded early and they nearly did so even earlier this time as a fine first minute pass from Nicolas Carnat split open the Town defence leaving Luke Shearer in a one on one duel with Richard Walton. But the on loan Lincoln City custodian stood his ground to pull off an excellent save at the expense of a fruitless corner. Stourbridge looked to threaten again when Luke Benbow looking suspiciously offside was clear but he was pulled up for handball. Had Matlock gone behind early on then it would have been a tough night. But composure was gained and with Joe Doyle-Charles scrapping away in midfield with Michael Williams and Cribley providing the invention, Matlock established a foothold. Kieran Wallace drove fiercely but harmlessly high and wide on 11 minutes to give the hosts some encouragement. Four minutes later Ricky German cut on from the left and goalkeeper Matt Gould flung himself low to his right to tip the 20 yarder on to the post and out for the first of two corners. The last flag kick saw Adam Yates beginning to celebrate a goal as his header looked destined for the target only for it to be knocked off the line. The game then lost some of its creativity although it was tense and hard fought. Matlock’s Jake Green was the victim of a miscarriage of justice, booked when tangling with Shearer who appeared to have impeded Green. Nothing came from the often dangerous free kicks of Benbow who nevertheless was given two further chances before the break from contentious free kicks. Walton tipped the first on to the base of the post, the other drifted yards wide. Two minutes after the restart Dwayne Wiley found himself in trouble from a pumped high ball but a fantastic recovery saw him retrieve possession under pressure from Shearer. It led to a swift Matlock counter attack, German lifting his shot high and wide after a break down the left. A gigantic throw from Tom Tonks had Matlock on the defensive as the Glassboys forced three corners on the trot. 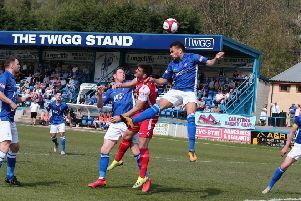 Matlock dealt with the pressure admirably before Walton was fully behind and well positioned to hold a long range strike from full back Brad Birch. Matlock gave a debut to substitute Amos Kabeye who was soon booked for a foul on Arran Hayden. With a little over 20 minutes left, Matlock came desperately close to finding the breakthrough. The impressive Yeomans, found space intelligently on the left to find Williams with a marvellous cross at the far post but Gould pulled off possibly the best save of the season at the DCJ Group Arena to tip the header over the bar. That concluded the goalmouth activity as defences remained on top with Matlock deserving their share of the spoils after a hectic few days. MATLOCK TOWN: 1 Richard Walton 2 Jake Green 3 Jan Yeomans 4 Joe Doyle-Charles 5 Adam Yates 6 Dwayne Wiley 7 Kieran Wallace 8 Michael Williams 9 Ricky German ( 16 Chris Ondong-Mba 87) 10 Ted Cribley (14 Zak Brunt 79) 11 Harry Limb (15 Amos Kabeya 59). Subs not used: 12 Jake Phillips 17 Marshall Willock. STOURBRIDGE: 1 Matt Gould 2 Arran Hayden 3 Brad Birch 4 Paul McCone 5 Stuart Pierpoint 6 Tom Tonks (12 Aaron Forde 67) 7 Chris Gallagher 8 Leon Broadhurst 9 Luke Benbow (14 Josh Cooke 58) 10 Luke Shearer (16 Edilson Antonio 71). Subs not used: 15 Alex Cameron 17 Peter Hawk.